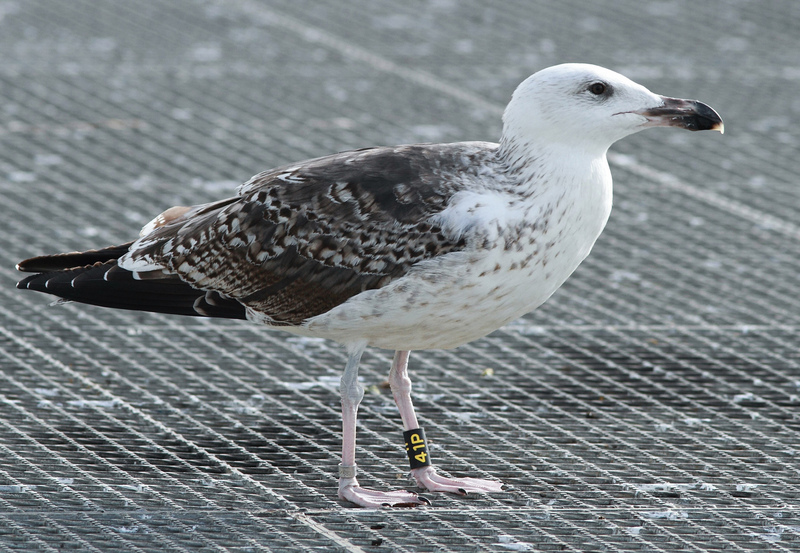 Great Black-backed Gull (Larus marinus) 41P 1CY-2CY, October 2015 - October 2016, Boulogne-sur-Mer, France. 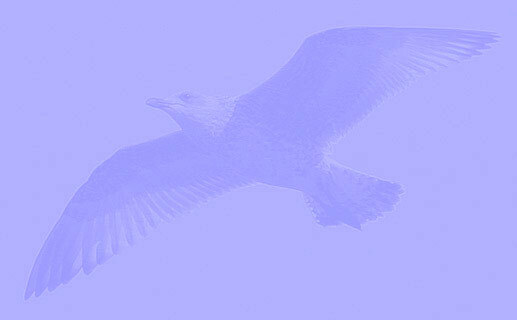 Picture: Jean-Michel Sauvage. 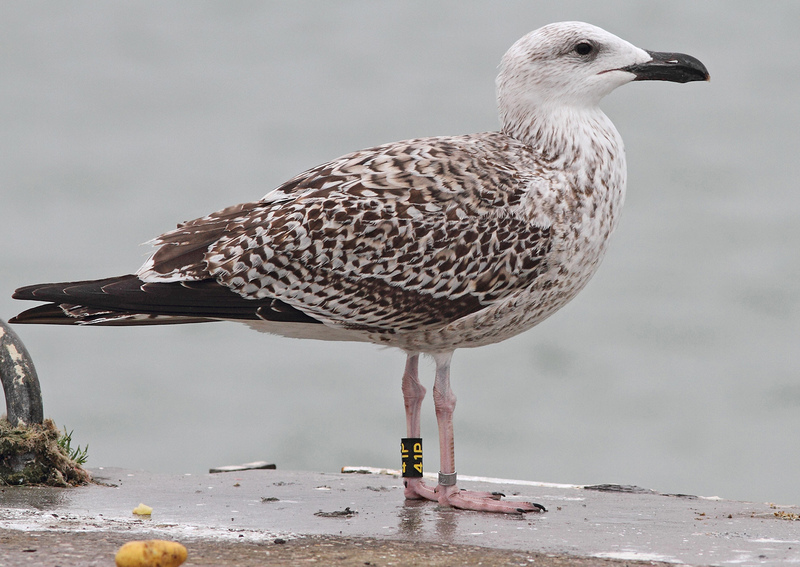 Ringed as pullus on June 24 2015 at nuclear power plant of Paluel, Seine maritime, Normandie, France. Probably male. 24/06/2015 - nuclear power plant of Paluel, Seine maritime, Normandie, France. 23/09/2015 - port de Boulogne sur mer, France. 05/10/2015 - port de Boulogne sur mer, France. 08/10/2015 - port de Boulogne sur mer, France. 12/10/2015 - port de Boulogne sur mer, France. 24/10/2015 - port de Boulogne sur mer, France. 11/11/2015 - port de Boulogne sur mer, France. below: Great Black-backed Gull (Larus marinus) 41P 2CY, October 18 2016, Boulogne-sur-Mer, France. Picture: Jean-Michel Sauvage. Extensive partial autumn moult in inner wing-coverts and upper tertials. below: Great Black-backed Gull (Larus marinus) 41P 1CY, November 11 2015, Boulogne-sur-Mer, France. Picture: Jean-Michel Sauvage. Moult in scaps not really speeding up last month. 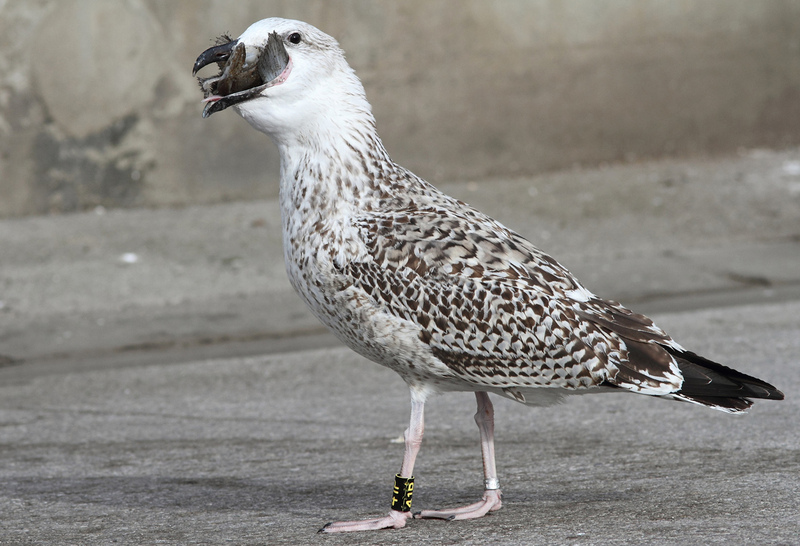 below: Great Black-backed Gull (Larus marinus) 41P 1CY, October 22 2015, Boulogne-sur-Mer, France. Picture: Jean-Michel Sauvage. US: 75-99%, LS: 1-25%, TOT SCAPS: 25-50%.